2017 has been a hell of a year for really fantastic video games. Not much else mind you, but video games; top notch. I remember in years gone by when compiling these types of lists, I struggled to put together a collection of ten truly great games. It was because the bottom end of the list sometimes felt like they were just filling the gaps. This year, there have been more games I actually wanted to talk about than I could fit onto this list. I could have easily made this a top 15 or maybe top 20 list. But I’m not an insane person. Sure, I’ve talked a lot about the problems of Battlefront II and my personal conflicting feelings about Destiny 2. But they’re both games I am still playing and getting enjoyment out of. It’s because I like them so much that I complain, hoping they’ll get better. They instil a passion for the medium in me that makes me want to talk about them critically in the inane hope that someone might read them and actually act on my “expert” opinion. I still have a lot from this year I really want to catch up on. Resident Evil 7, Dishonored 2 and Nier: Automata to name just a few. There are already some really exciting looking games coming out early next year too. So no matter how crappy everything else seems to be going in the world. At least video games are great. Never would I have believed that Nintendo could shake up their most beloved franchise so profoundly, while also taking it all the way back to its original roots. Nintendo were on a trend of changing things up in the Zelda franchise for a while now. After releasing a string of games which seemed almost interchangeable at times, they put out A Link Between Worlds in 2013 which seemed like them testing the waters for this eventual release; a game that mixed up the game’s usual progression and gating techniques to give players a less “designed” experience. They didn’t just shake things up though, it seemed like the developers had looked at what made those early Zelda games so beloved and tried to recreate that somewhat in their approach. 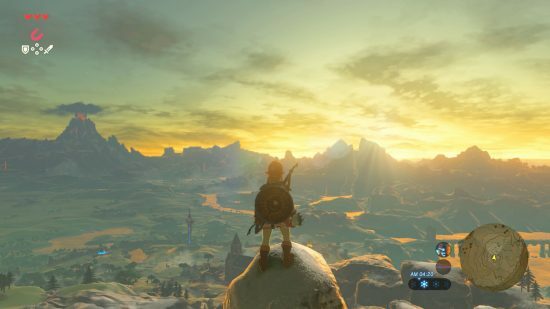 Breath of the Wild seems like the final realisation of that idea in what has to be the biggest and most ambitious video game Nintendo have ever produced. Imagine, back when you were a young child, playing the original Legend of Zelda on the NES. Despite the simplistic graphics and limited technology of that game, a young kid’s mind will tend to fill the gaps with their own imagination. 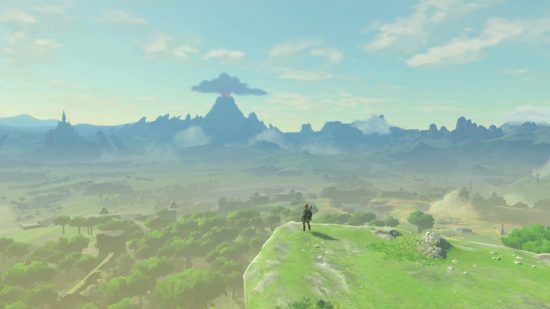 Breath of the Wild, to me at least, feels like someone took that first Zelda game, and took those imagined worlds and just put them into a game. Instilling a childlike wonder back into the franchise that it struggled to recapture after Ocarina of Time. It’s actually also a surprisingly fresh take on open world games in general, let alone the Zelda franchise. Rather than throwing a huge map at you, filled with markers for you to run between. BotW gives you nothing, it drops you into the world naked, and after a brief introduction of the game’s basic mechanics it just tells you to work the rest out for yourself. The world is filled with things to do, but tells you where none of them are. You have to actually spend time looking around, climbing to high points and physically making markers on your own map to remind yourself to explore them later. While the main story can be forced through in a pretty short amount of time if you had a mind to, the game is filled with towns, and temples and other diversions to keep you occupied for endless hours. I had to physically force myself to actually finish this game, because I was having so much fun just playing in this world that I didn’t want it to end. And when it did end, it was a tad disappointing. While the story isn’t a fat lot to get excited about, it’s an incredibly strong set of gameplay mechanics based in an absolutely gorgeous world that keeps you invested. It’s almost too hard to accept that it’s on the Switch of all things. It’s not a perfect game, don’t get me wrong. Inventory management can be tedious. Coupled with the durability system that has the player always on the hunt for weapons to replace their broken stuff. You could argue that once you have a good collection of equipment, you’re incentivised to avoid exploration and combat to maintain your collection of items. But that would mean denying yourself the best parts of the game. I personally never worried too much about my gear and just used anything I had, spending all my time just wandering around the world and discovering the hundreds of little secrets littering the landscape. I could go on and on for hours, but I’ll stop short and say that Nintendo have made a masterpiece here in my opinion. While the openness of this game won’t appeal to everyone, if you find yourself getting drawn into games like Skyrim or most any open world game like this then this could be the one gem you play for the rest of your life. It’s an amazing game and one of the best things Nintendo have ever made in my opinion. 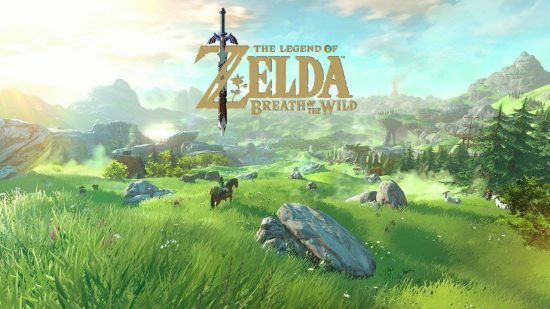 Posted on December 30, 2017 December 29, 2017 by WooderonPosted in 2017, Best of Year:Tagged breath of the wild, game of the year, goty, link, nintendo, switch, the legend of zelda.